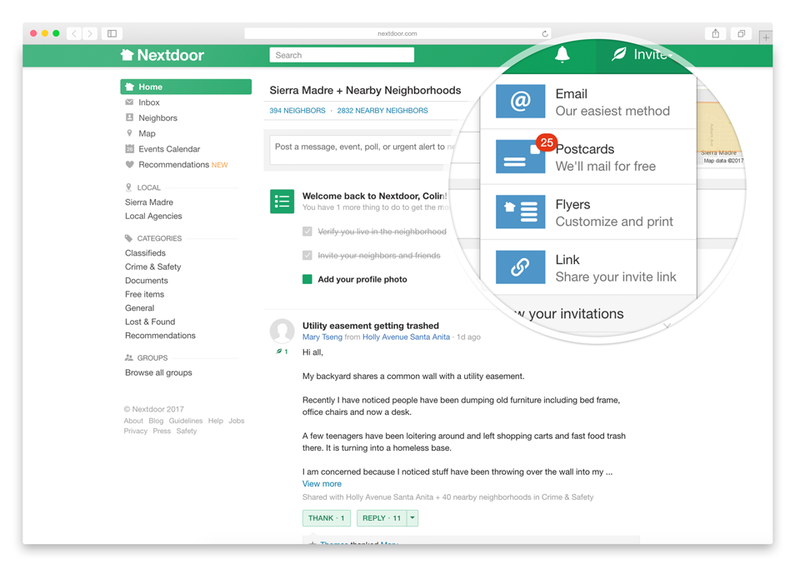 Nextdoor leverages the power of web-based address books to drive new user acquisition. Nextdoor, the private social network for neighborhoods, knew that driving platform growth meant leveraging human connections. By optimizing invitation flows with CloudSponge, Nextdoor uncovered a viral growth strategy that allowed rapid growth in the United States and internationally. Nextdoor is a social networking service for neighborhoods that allows users to connect with people who live in their own neighborhood and nearby areas. The company launched in the United States in 2011 and since has rapidly grown into markets such as the United Kingdom and Netherlands. Nextdoor prides itself on tapping into residential communities and offering a solid ecosystem in which neighbors can connect, meet, and exchange information. The Washington Post quickly recognized when Nextdoor launched that the then small company “seems poised to ride the wave of people’s desire to connect back to their community”. Prompting users to send invitations to users via email is the “easiest method” and responsible for a great deal of Nextdoor’s viral growth. “Email is one of our largest channels in terms of viral growth and Nextdoor is certainly a viral growth story. 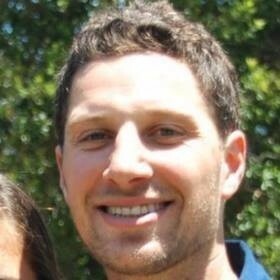 Invitation flows are extremely important and CloudSponge is the nexus of that,” says Alex Karweit, head of growth engineering at Nextdoor. 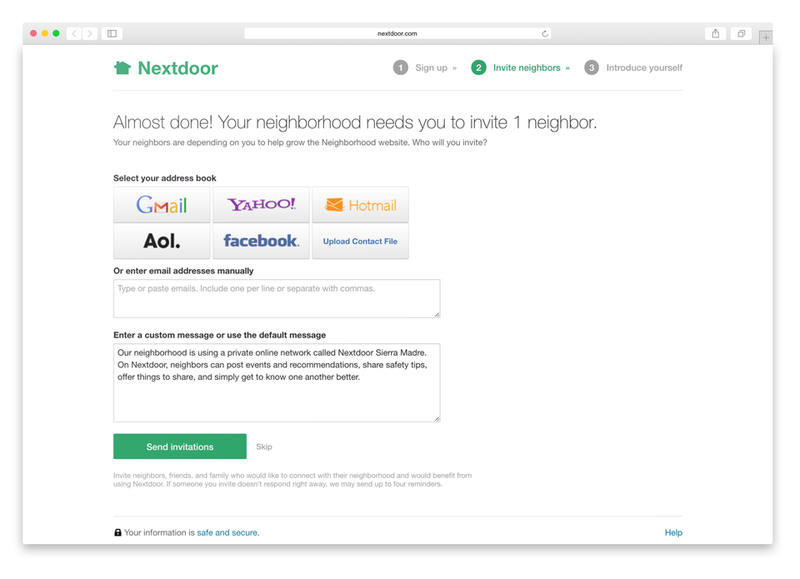 As early as 2013, Nextdoor identified that a solid invitation strategy was a critical component to penetrating neighborhoods and began experimenting with integrating address book importing into the onboarding experience. 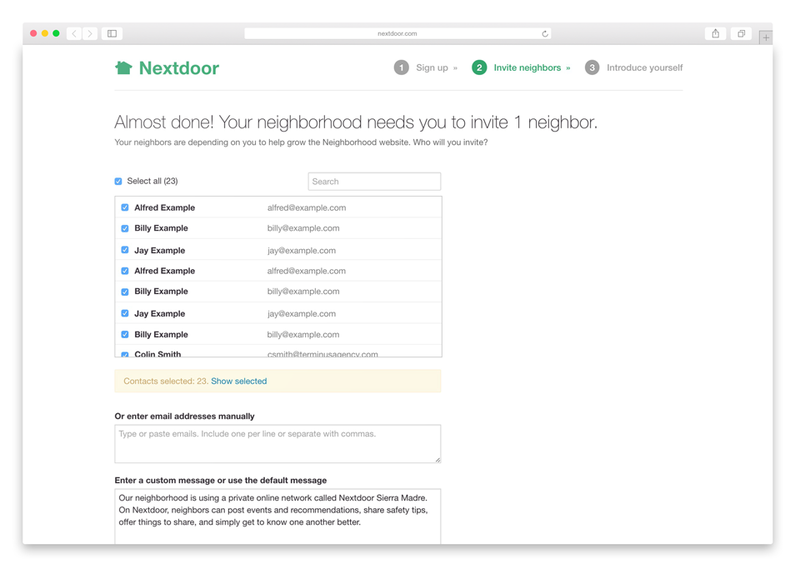 In just a few clicks, it’s simple to invite dozens of neighbors from your address book thanks to Nextdoor’s integration with CloudSponge. One of the added benefits of integrating with CloudSponge has been the speed with which Nextdoor has been able to integrate several address book sources and the reduction in maintenance costs that comes with maintaining several different APIs and authentication streams. Nextdoor is able to rapidly add new contact sources based on country and region due to their integration with CloudSponge. This phenomenon, however is not limited to address book importing for platform invitations. Karweit reflects, almost philosophically, about the power of outsourcing specific application functionality to third-party software vendors with a focused product strategy. In 2016, Nextdoor began their rapid international expansion into the Netherlands and continued into the United Kingdom in February of 2017. The ability to scale with tools like CloudSponge is critical to not losing momentum as Nextdoor continues its international expansion. With every new country, there comes a host of new potential contact sources and languages. Instead of wasting development hours configuring integrations and APIs for every individual webmail service, CloudSponge offered Nextdoor a single integration point and reduced the man-hours dedicated to maintaining APIs when they contact sources changed. “When you’re talking about [integrating with] something like Gmail, it’s one provider so it’s not that big of a deal. It’s a bigger deal when we’re in 50 countries and their are 60 email providers. You start thinking about the fact that one of those address book sources is going to be changing.” Every change, he notes, is potentially a lost batch of new users, broken API connections, and time to fix the integration. “It’s kind of like the birthday problem,” Alex describes. He continues to describe a scenario where in a large enough group, someone is celebrating a birthday nearly every day. It’s the same with expected changes to APIs over a large set of address book providers. 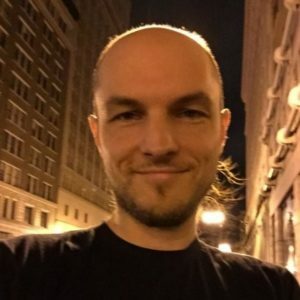 “One of them is going to change and it’s kind of like playing whack a mole.“ Reducing that problem by delegating the API maintenance to CloudSponge has been critical for moving quickly Alex believes. Editor’s Note: If you’re interested in learning more about how Nextdoor uses CloudSponge, check out our complete teardown of Nextdoor’s invitation system. Nextdoor is a social networking service for neighborhoods that allows users to connect with people who live in their own neighborhood and nearby areas. Help users easily invite and connect with neighbors by leveraging address book contacts. Additionally, enable rapid scaling to new countries with different address book contact sources.